In our ever expanding civilization with its voracious push into the frontiers of the world, it is exciting to know that there are places hidden away in the far flung remote corners of this planet of ours which have remained untouched, untamed, and unexplored. Existing in solitude for millions of years, some locales seem to be able to resist our relentless push into the unknown, and exist very much as they always have and perhaps aways will. One such mysterious and little understood place sits within the sprawling wilderness of South America’s highlands, a place that is at once achingly beautiful and elusively mysterious. Here is a world within a world that sits perched high up within the clouds, with a history of Native legends and exploration just as daring as any adventure story. Within the confines of this patch of wilderness scamper creatures we know nothing of, and mysteries we are no closer to understanding than we were when it materialized out of the fog nearly 30 years ago. 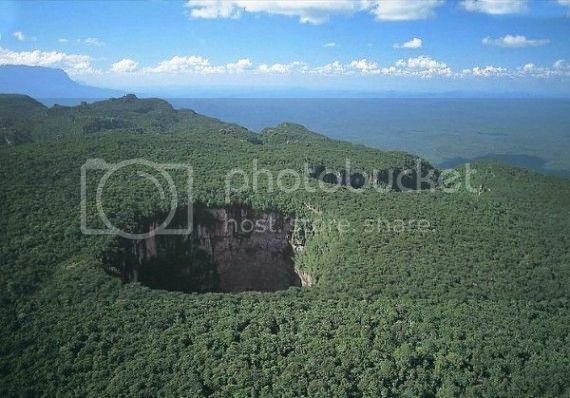 Welcome to the lost world of Venezuela’s mysterious mountaintop sinkholes. Scattered about the jungles of the Guiana Highlands of South America are majestic table top, or flat topped, mountains that rise up from the rain forest anywhere from from 1,000–3,000 meters (3,300–9,800 ft) up into the clouds. 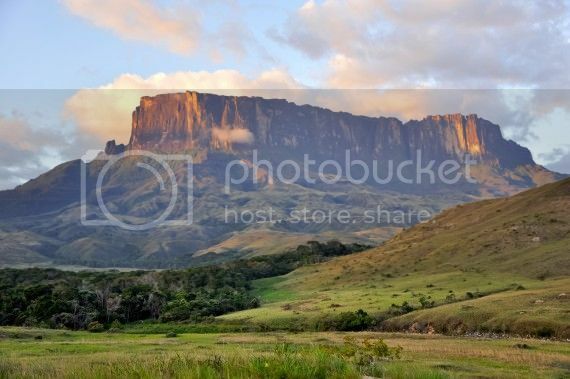 These are the awe inspiring tepuis of South America, notable for their sheer rock cliffs that erupt forth from the surrounding green to tower over and dominate the landscape, as well as their unique, ancient ecosystems living high above the forest floor, evolving in total isolation from the jungle, and indeed the world, around them. In fact, the ecology of these towering mesas is so completely unique and isolated that the tepuis are often referred to as “islands above the rainforests,” as well as “the Galapagos of the mainland.” Many of these tepuis are obscured by a perpetual crown of clouds and fog, masking their surfaces from view and requiring radar photography from aircraft to get a any visual image of them. Most of the tepuis are so far removed from the world below them that they have their own climates and weather, existing in almost another place and time. There are more than 100 of these tepuis dotting the landscape of the southern parts of Venezuela and Guiana, as well as in the bordering regions of Brazil, and they have held a place in the legends and myths of the local Native peoples for thousands of years, with the very name tepui meaning “house of the gods” in the language of the indigenous Pemon people. No matter how much we explore this planet, no matter how much we strive to tame, understand, and control it, it seems there will always be wild places like this. Our planet shows an almost sentient will to hide them from us, to cultivate them, and to let them remain unchanged as they have been for millions of years. What secrets lie hidden from us at the bottom of these jungle holes held aloft in the sky? Will we ever understand their mysteries? Were we ever meant to?